Self-marketing means knowing the specifics of your own work and being able to promote it: what makes it special, is it worth exhibiting or buying? With special focus on female self-marketing, we will take a look at how to present the work and get ready for the international art scene. 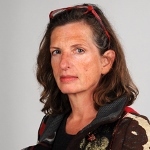 Dr. Ines Lindner is an art historian and lecturer. From 1990 to 2000, she taught at the Berlin University of the Arts and from 2000 to 2008 she did research and taught in Montreal. In the recent year, she was the head of the Center for Interdisciplinary Studies at the Muthesius Kunsthochschule in Kiel, helped to shape the artists' sponsorship program for Schleswig-Holstein and was a member of the selection committee from 2008 to 2012.